Korean radish is a root vegetable that is very mild in flavor with a dense crunchy texture and mainly used in Korean dishes, salads, pickles and slaws. Not be confused with it’s cousin the daikon radish which has a stronger, pungent flavour. You can typically find these at Asian supermarkets but are more commonly found at Korean supermarkets. When picking them out, make sure they are smooth-skinned and not bruised. They should have a very firm texture, try to stay away from soft Korean radishes. Look for the ones that have a bit of green at the top. When eaten raw, it is sweet and slightly peppery. It is a lot milder than daikon radish and does not have the earthy bitterness to it so it is great to use raw on salads and slaws. In its raw form, it is very crisp and crunchy, which is why they make fantastic pickles. 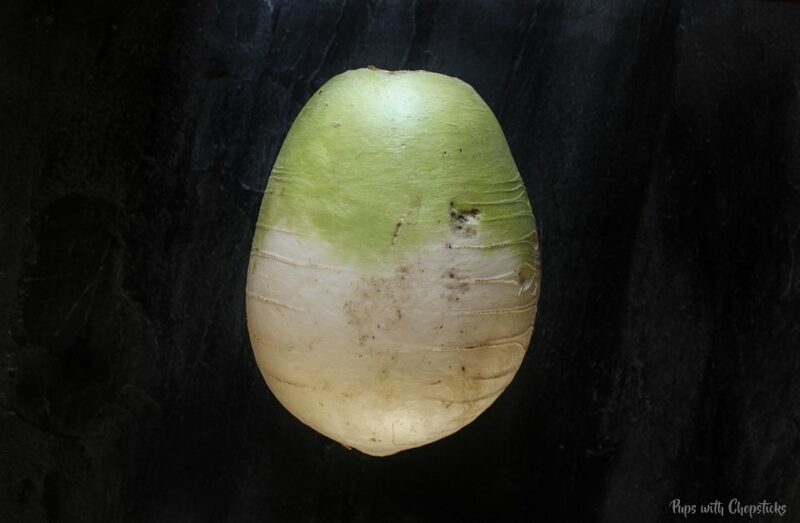 In it’s cooked form, it is similar to the daikon radish and has a soft velvety consistency. Compared to the daikon, Korean radishes are a lot denser so it has a bit more of a crunch and can hold its shape better when cooked. Korean radishes should be stored in the crisper drawer either wrapped in newspaper or covered in a bag with lots of holes in it to prevent it from drying out and getting wilty or getting too much moisture which can cause it to mold.